Exceptional box with sculptural cover in red and black glazierite with bone and brass accents, base in stainless steel and interior in burgundy suede by Johnson and Marcius for Karl Springer, 1980s. Glazierite was a material unique to Karl Springer. Johnson and Marcius made special pieces which were sold through the Karl Springer showroom. The Berlin-born, New York–based designer Karl Springer brought a chic, high-fashion sensibility to furnishings. During his heyday in the 1970s, Springer’s work was a favorite of the glamour set, who enjoyed the novelty of pieces finished in rich and striking materials that ranged from exotic hides and skins to lacquer and chromed metal. In a sense, Springer was a pre-postmodernist. Much as the dull, safe, corporate sameness of late 20th-century modernism prompted Ettore Sottsass, Michael Graves and others to explore new and provocative structures and materials in design and architecture, so, too, was Springer driven to enliven his creations with fresh and alluring energy and sleekness. Springer came to New York in the late 1950s and found work arranging window displays at the department store Lord & Taylor. He had studied bookbinding in Germany, and, using his meticulous skills, he began crafting desk accessories wrapped in leather as a sideline. These pieces were sold in luxury stores like Bergdorf Goodman, and drew a sophisticated clientele that included the Duchess of Windsor. By 1965, he had established his own Manhattan atelier, and at his death he had showrooms as far afield as Los Angeles, Tokyo and Munich. The chairs, tables, credenzas and other furniture forms Springer created are generally simple, but substantial, and often have robust, rounded lines. The attraction of Springer’s work lies in his insistence on exacting construction and, above all, his eye for unusual materials and finishes. He employed Lucite, brass, and gunmetal along with chromed and polished steel, and revived exquisite finishes rarely seen since the days of Art Deco masters such as Émile-Jacques Ruhlmann and Jean-Michel Frank: shagreen (a type of sharkskin), python, goatskin, bone, horn, and lacquered parchment, as well as fabrics that include batik prints. Made of such materials, Springer’s work is by its very nature flamboyant and eye-catching: a suite of pieces will astonish, and an artfully placed side table in exotic hide will add a surprising spark. Lidded box covered in burgundy python by Karl Springer, American 1980s. Interior and bottom covered in burgundy leather. Springer’s pieces are meticulously crafted. Exceptional box clad in pen shell with brass hardware by Karl Springer, American, 1980s (metal label on bottom reads "Karl Springer"). A nice example in beautiful condition. Original invoice pictured. Impressively-scaled 1980s tessellated bone box with cream painted interior, manufactured in Colombia by Jimeco. Tessellated camel bone boxes lined with black velvet, finished on all sides. Whimsical hinged box in the shape of a book. 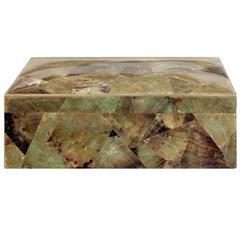 Tessellated stone exterior with inlaid brass trim; dark-brown wood interior. In fine vintage condition with warm patina to brass trim.